Dreaming of a beautiful hardwood floor but can’t bring yourself to shell out that much money for it? If you are in search of hardwood flooring for your home but don’t want to break the bank, engineered wood flooring is the perfect choice for your home. Our experts at Alexandria Carpet One Floor & Home provide high-quality engineered wood flooring sales and installation to homes across Alexandria, VA and all of Northern Virginia. Our team of flooring experts can help you to choose the best option of engineered hardwood that would fit your home’s needs and budget. We are proud to carry different types of engineered hardwood floors in our showroom, and are guaranteed to have the perfect hardwood flooring to fit your household. Unlike traditional hardwood, which is applied as a standalone floor, engineered ﬂooring is manufactured by bonding a decorative layer of wood over layers of existing hardwood beneath it. This process not only provides some additional stability to an existing floor, but also maintains the elegant appearance and characteristics associated with solid hardwood ﬂooring, without the extensive installation. Some engineered ﬂoors are pre-ﬁnished, while others are designed to be sanded and ﬁnished after installation. 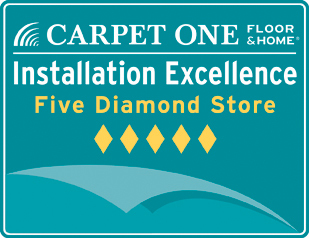 Here at Alexandria Carpet One, we are proud to offer both options for your home. Engineered ﬂoors may be laid as ﬂoating ﬂoors, glued to a sub-ﬂoor as an overlay, and in some cases ﬁxed as a structural ﬂoor. Our team of professional craftsmen will get your installation completed as quickly as possible with amazing results. Engineered hardwood flooring is a cost-effective alternative to traditional wood flooring. It still retains much of the aesthetic appeal of pure hardwood floors and is also easier to install, repair, and replace, if necessary. If properly cared for, engineered wood floors will last a lifetime (or more), and just as long as their solid hardwood counterparts. If you want the unique look and feel of a hardwood floor for a fraction of the cost, engineered wood floors are an excellent choice. What are the benefits of engineered hardwood flooring? Engineered hardwood flooring is long lasting, durable, and cost effective. Though much more affordable than a traditional hardwood floor, engineered wood flooring is just as durable and long lasting, and provides a similar feel and aesthetic. At Alexandria Carpet One, we provide the best engineered wood flooring on the market today, complete with expert installation. Our engineered wood flooring installation specialists are highly skilled and knowledgeable about the entire installation process. We bring exemplary craftsmanship and dedicated attention to detail to each and every one of our flooring installation projects, and use industry-leading techniques to apply engineered floors on even the trickiest bases. Our skilled team expertly installs your engineered wood floors, maximizing longevity and aesthetic appeal, leaving you with an amazing end result for your home. Give our flooring specialists a call today!